So if I'm to be really honest I bought this polish because of its name. I just think it's hysterical! Anyway the actual colour of this polish closely resembles chocolate - or more accurately maybe mud pies . . . ? I do like that it's a creme finish but the reality is hey, it's brown! lol The application was a bit streaky so this shows three coats. Then I stamped with China Glaze Hi-Tek. 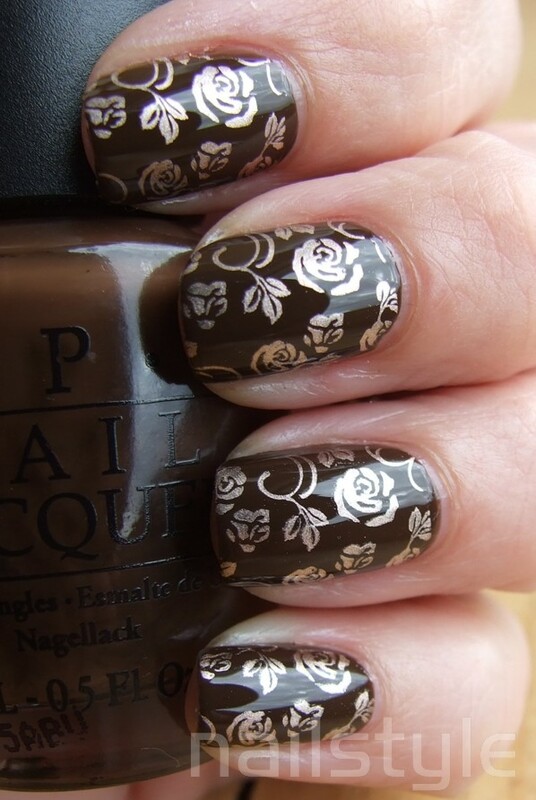 The gold stamping goes really well with the brown! Love it! I love this stamp!! Looks great over Suzi Loves Cowboys!! This mani is so gorgeous! Love everything! DUDE! How dare you dis my special brown polish??? HAHHA! You should have bought this cause it's an awesome brown!!! It stamp well too-I've got a post coming up tomorrow that I used this to stamp with! This mani is gorgeous! Haha I'll look forward to seeing it - never thought to use it for stamping! I actually think this brown is gorgeous! Great stamping!